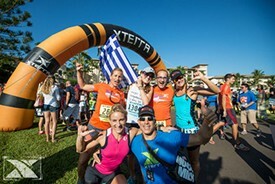 Honolulu, HI – Four T S Restaurants on the island of Maui – Hula Grill, Duke’s Beach House, Kimo’s and Leilani’s – have renewed their role as title sponsors of the XTERRA Kapalua Trail Runs for the fourth consecutive year. The events, known as the Hula Grill XTERRA 5K Trail Run, Duke’s Beach House XTERRA 10K Trail Run, Kimo’s XTERRA Keiki Run, are scheduled for Saturday, October 25, at Kapalua, Maui. Leilani’s XTERRA Run Course and Leilani’s Run Prime Awards, will go down on the main event – the XTERRA World Championship on Sunday, October 26. To drive home the partnership with its employees T S Restaurants created a race within a race dubbed “The T S Restaurants XTERRA Challenge.” Each of the four restaurants will field a team of five runners and the team with the fastest cumulative time in the 5K race will take home the coveted TS Trophy. Last year Hula Grill captured the perpetual trophy, which is proudly displayed at the restaurant all year round, for the second time in a row (Duke’s Beach House won the inaugural challenge back in 2011). Runners will be treated to picturesque and challenging courses that will take them from the beach, up to the mountains, and then back to the beach. In addition, a Paul Mitchell cut-a-thon will be held at the site of the race. Runners and their families can get their hair cut by professional Paul Mitchell stylists, with all donations benefitting the Challenged Athlete Foundation. More than 1,000 runners from around the world participated in the event last year. Both courses started at The Ritz-Carlton Kapalua, then traversed up and down the West Maui Mountains, and then along D.T. Fleming Beach, before heading back to The Ritz-Carlton. “As far as views go, you can’t beat this race,” said two-time 10K winner Willie Schefer said. The Leilani’s XTERRA Run Course primes are awarded to the competitors with the fastest run times during the XTERRA World Championship off-road triathlon. The XTERRA World Championship held on Sunday, October 26, is the pinnacle event of more than 100 off-road triathlons held in 25 countries. TEAM Unlimited is a Hawaii-based television events and marketing company, founded in 1988. It owns and produces XTERRA and in 2014 will offer more than 300 XTERRA off-road triathlon and trail running races in 25countries worldwide. In the U.S. alone nearly 200,000 participants took part in the XTERRA lifestyle last year. In addition, TEAM TV has produced more than 300 adventure television shows resulting in three Emmy’s and 42 Telly Awards for production excellence since 1990. View samples at www.xterra.tv, and learn more at xterraplanet.com and xterratrailrun.com.